CANNING: I'm either hitting the bottom or reaching new heights -- I had to run to the store for more pectin on my bicycle at 9:30. Though I'm pretty happy with Pomona's pectin, but it comes in two parts, and the dry part (you make a liquid with the other part) runs out at a ratio of 3 dry envelopes to 1 wet part envelope. I need a bulk solution. Like the organic unrefined cane sugar... I've ordered a 50# sack, it'll cost me $36 at Whole foods. I'm not ready to join a canning 12-step program yet. There are still green gage plums, yellow peaches, pears, figs, quince, apples, Concord grapes and tomatoes still to be had. And lots more lemons from Regan's tree to keep the costs down since every jelly/jam recipe calls for some lemon juice. I should start saving the seeds to put in cheese cloth -- that might help reduce the amount of pectin required. SOLAR DEHYDRATOR: my brother is making progress. He's thrilled that he has an excuse to get angle clamps and he caught something in the plans that Jon and I missed, which accounts for the extra 30' of 1" x 2" ... yay for brothers! PICTURES: I swear, I am going to insert pictures into past postings, but for now, you can view my canning madness on my Flicker Food album. Holey jam! I think you are ready to start that canning 12 step program. Actually, I'm just jealous! 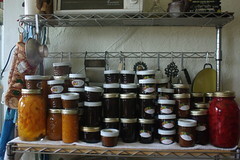 I've only squeezed in a bit of canning here and there and I need to get on it or I'll be regretting the lack of jam and such come February. my gosh! you need an apprentice. maybe you can start a canning reality show or something! Wow, you get your sugar much cheaper than I do. I paid that much for a 25# bag! Wow - that's expensive! No Whole Food$ in your town?